Brian Aldiss has donated his archive to the Bodleian Library, Oxford. In celebration, the Bodleian Library has published this collection of recent non-fiction pieces. When I say recent, five of the twelve essays gathered here are original to this volume, and of the others the oldest dates from 2002. Yet, though recent, there is a nostalgic feel to these pieces, returning again and again to the early years of his career. Several of the pieces refer back to Aldiss's time in Burma and India during the Second World War, and particularly to experiences that would directly inspire his later fictions. It seems he had what is called a good war and enjoyed the experience. As he says at the beginning of "Paradise Square": "I had spent four years in the Far East, in the British army, and wished I were back there. Britain was an alien land" (p. 15). 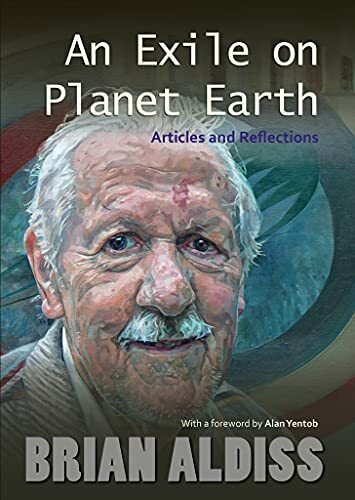 And yet, none of these essays is wholly or even primarily about his time in the East, whereas several of them take us back to Oxford at the beginning of the 1960s, when Aldiss had separated from his first wife and was living in dingy surroundings while starting to make it as a writer. "Paradise Square," perhaps the best piece in the collection, describes being nearly forty, divorced, broke, separated from his children, and living in a single room in a crumbling house on Paradise Square whose weekly rent he couldn't always manage. In many ways it is a picture of failure, and yet the essay is full of affection for the characters and the life of the Square. You get the sense that Aldiss thrived on these circumstances, and also of the urgency that drove him to write some of his best fictions. It was here in Paradise Square, for instance, that he wrote Greybeard (1964), which tells of a human race rendered sterile and childless, a reflection, as he admits, of his own situation, having lost his children as a result of his divorce. Perhaps Paradise Square shines so brightly in Aldiss's memory because it was here that he began to receive acclaim and, more importantly, good money for his novels. In his afterword to a recent edition of Hothouse (1962) he again takes us back to the war, recounting how he managed to survive a forest fire in Burma, and how he came upon the biggest banyan tree in the world by the River Hooghly in India. Unable to settle to life back in Britain—"Whereas I had adjusted to the squalor and poverty of India, I hated the squalor and poverty, allied to a depressing climate, of my homeland" (pp. 28-9)—he put these wartime memories into a story about a mango tree covering the world. The story, "Hothouse," was published in F&SF in February 1961 and was followed by others until, "one fine morning in 1962, my girlfriend went out to collect from her doorstep her pint of milk and found there a strange object wrapped in an Irish newspaper" (pp. 29-30). It was a Hugo award, and his position in the genre was assured. Aldiss is being, perhaps, a little disingenuous here; he had, after all, won a special Hugo Award for Best Newcomer four years before. This is, basically, the Brian Aldiss myth of origin, the rather romantic image of the outsider whose creative genius is fired by that very sense of alienation. And we get echoes of it all the way through this collection. He was, let it be said, literary editor of the Oxford Mail during the 1960s, which may not have been especially well paid but was certainly influential—for something like twenty years more SF books carried a quote from the Oxford Mail than from any other newspaper. He was, by the time novels like Greybeard appeared, recognized alongside J. G. Ballard as one of the seminal voices of the British New Wave. And he would go on to achieve not only a preeminent position within science fiction but also an unusual level of acceptance and recognition within the literary establishment. Yet throughout his work the image of the outsider recurs, and it is clear from this collection how much Aldiss identifies himself in that position. He gives his revised introduction to The Penguin Science Fiction Omnibus (first compiled in the 1960s, again) the title: "It's the Disorientation I Relish." The title seems to speak of an outsider view, and within the piece he quotes James Tiptree Jr.'s remark about "the disarray of the soul" (p. 85) with approval as if it summed up both what drove him to science fiction and what he hoped to achieve within the genre. Again, as he has spoken of the origins of Hothouse and Greybeard in events in his own life, he says here of Non-Stop (1958) that "I was conscious of reconstructing on one level my own confining circumstances" (p. 89). Ever the outsider: one can't help feeling as we read through the various pieces about science fiction in this collection that he is drawn to the genre less as "fables of a technological age" (p. 81) and more as a form of outsider art. This is perhaps why his introduction to the Penguin Classics edition of The War of the Worlds is one of the less satisfying pieces here. It is a fairly conventional reading of the novel, but more than that it places Wells inside the intellectual and literary movements of the day. He finds an echo of the impetus behind Wells's novel in Kipling's poem "Recessional," which is almost exactly contemporary; he also links the destruction of the English countryside in the novel with D. H. Lawrence's exclamation: "Three cheers for the inventors of poison gas" (quoted, p. 121), ignoring in this instance the fact that a quarter of a century and a World War came between the two. But all of this serves to makes Wells's novel canonical rather than an example of outsider art, and this seems to rob the essay of some of the bite and life that science fiction attracts elsewhere in the book. He is much better on Alexander Solzhenitsyn's The Gulag Archipelago , perhaps because this truly is outsider art, and perhaps because the prisoner who "returned like one returning from the dead" (p. 98) seems to echo the misfortunate young man who returns to his native land after years away. There is something romantic and noble in the suffering that Solzhenitsyn details. Aldiss quotes, with approval, Lesley Branch, when she writes of "that heady draught of romanticized melancholy which only the East knows how to distill, and which, once tasted in the West, is forever craved" (quoted, p. 100). Aldiss's East may be a different one from Solzhenitsyn's, but this statement sums up the self-image that informs this entire volume, and may be why he responds so well to the Russian writer. Though it is worth noting that this volume contains "A Sight of Serbian Churches," in which Aldiss recalls, 40 years on, the Yugoslavian journey that was the basis for his only travel book, Cities and Stones (1966), and also "The Ashgabat Trip" which tells of a visit to the capital of Turkmenistan after he had written about the city in his novel Somewhere East of Life (1994), and both of these also have a healthy draught of romanticized melancholy. And yet for all this yearning for the East, whether Slavonic or Oriental, there is still something ineffably English about Aldiss. It is there in his prose, which has become, if anything, crisper and sharper as he has got older. He is deceptively easy to read, and yet the reader must stay alert because an aside, a casual allusion, can recast everything he is saying. This is masterful English prose that reaches back to a long tradition, exemplified in Aldiss's account of an imaginary meeting with Thomas Hardy. Here he talks of "the conscious oppressed by the unconscious . . . Hardy was always in conflict with himself" (p. 161). What we look for in others is often what is there in ourselves, and I think that his imagined Thomas Hardy in this essay is also the conflicted, alienated outsider Brian Aldiss. Paul Kincaid is a recipient of both the BSFA Non-Fiction Award and the Thomas D. Clareson Award. His most recent book is What It Is We Do When We Read Science Fiction .